Iranian Journal of Energy and Environment (IJEE), previously called Iranica Journal of Energy and Environment (IJEE) is an international scientific journal published by Babol Noshirvani University of Technology. The aim of the journal is to develop the international exchange of scientific and technical information in the fields of energy and environmental engineering. All manuscripts with significant research results in the areas of energy and environment and their application are welcome. 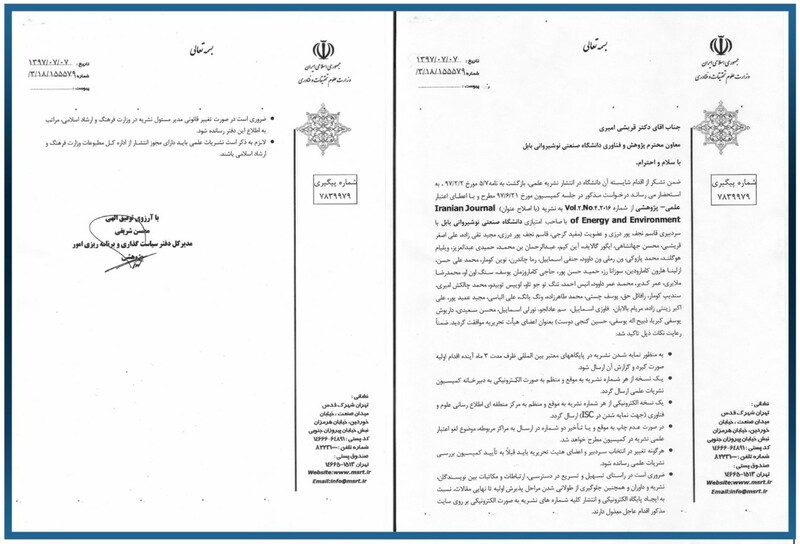 Iranian Journal of Energy and Environment (IJEE) appears four times, March, June, September and December every year considering the increasing importance of rapid, effective, international communication. Special issues on different occasions may be published based on commitments of editorial board members for attraction of top quality research papers. In harmony with the revival of nature and also in Persian calendar, Persian speaking countries celebrate New Years' Day known as Nowruz (March 21, 2019), that is a celebration of spring Festive. We wish you and your esteemed family the best healthy Persian New Year 1398 be filled with joy, blessing, success, prosperity and peace. Based on Iranian Ministry of Science, Technology & Innovation (Higher Education) IJEE was evaluated by the Ministry Higher Commissions. IJEE's ranking was approved as academic journal by the committee of "Journal Publication" as Scientific Research Journal. This means that all academic staff who published in IJEE their publication would be credited by their respective institute and universities. Please check out the approval letter shown in below.